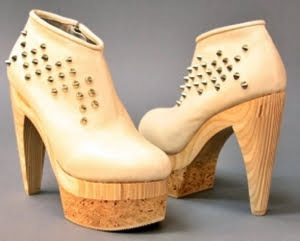 With an upper made with luxurious Ivory Lamb leather, these handmade 5.5" Ausiie Couture Leila Booties feature both a custom carved cork and wood heel with a 2" platform will have you going gaga for them. If that isn't enough luxury for you, then the thick memory foam inner sole lined with curly Australian wool will surely fill your luxe standards. This Ivory beauty also comes detailed with gunmetal studs embellishments, an inside zipper and is marked down to $299.00 from $439.00.